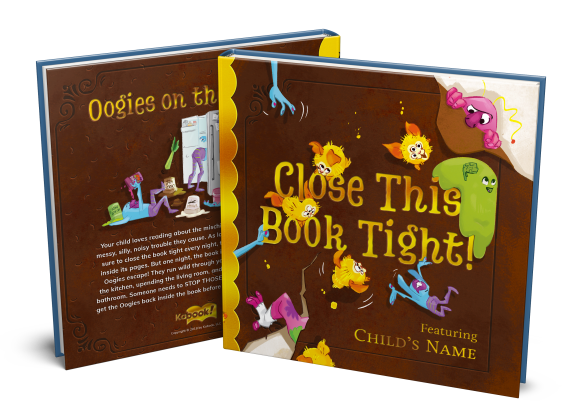 Close This Book Tight | Custom Children's Book | Kabook! The land of the Oogies is filled with silly beasts and wild monsters that love adventure . . . and mischief. All is well as long as the Oogies stay within the confines of their storybook world – but when the Oogies escape into the real world, the real trouble begins. Can your child wrangle the Oogies and restore order? Find out with our quickest book to build - there is no photo required but you have the option to add one if you would like. Can your child stop the Oogies? Answer a couple questions and upload a photo (optional) to build your book and find out! Step 1: Enter child’s info to build your custom Kabook! "...being careful not to wake [Name]"
"...headed straight for [Name]'s room." Skip Photo and Preview My Kabook! Add a photo of your child reading with their favorite stuffed animal, doll, or imaginary friend.